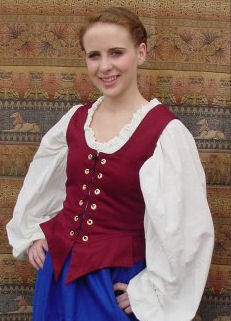 The bodice is made of cotton twill with a black cotton twill lining. The encased boning gives plenty of support and lift even for women who are gifted. The adjustable shoulder strap allows for adjustments for different body lengths and features a privacy flap to prevent any gapping of material. Can be worn with a chemise or a shirt underneath.